Since 1942 Fleetwood Farms has produced generations of consistantly desirable conformation Irish Setters including AKC Best In Show Ch. Fleetwood Farms Peg of My Heart,and her grandson our AKC Best in Show Ch. Fleetwood Farms Sixty Special and his grandson AKC Best In Show Fleetwood Farms Ch. 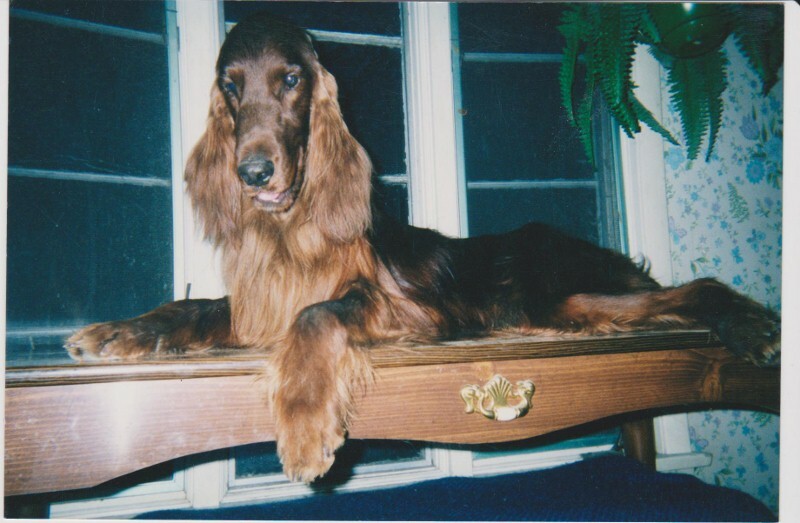 Starheirs Aaron Ardee, ROM- the most Best In Show winning male Irish Setter in American history, winner of 36 AKC Best in Shows, a record still undefeated today.He was awarded Group 2, twice at the prestigious Westminister dog show and rated 7th among the top Sporting dogs of alltimes. Many of our pedigrees go back to BIS Ch.Starheirs Aaron Ardee, to continue on this line of unparalled beauty. His full younger brother Ch. Fleetwood Farms Grand Marshal was Best of Winners over 400+ Irish Setters at the Irish Setter Club of Americia's first National Specialty. Fleetwood Farms mult-Best in Show Team of 4 stud dogs (shown on the cover of Dog World) is another example of the consistant good disposition and lovely conformation, we strive for. The Team consisted of 4 stud dogs, from 4 different Mothers but all sired by our Ch. Fleetwood Farms Starheirs Aaron Ardee. And theres the proof of our breeding program- 4 adult males with the good manners and calm temperament to be able to show together on one leash, and by a woman, Patricia Jesson. Since 1942 when Hugh and Virginia Rumbaugh started Fleetwood Farms (and 1972) when Patricia Jesson acquired her first Fleetwood Farms Irish Setter puppy, we have consistantly strived to breed good quality, dark mahogany setters, that are known for their calm, intelligent temperament. Nowadays everyone tries to say that, but its the way our dogs are raised that make the difference. Ask where your new puppy is kept? Outside in a kennel environment? My Irish Setters always live in the house, never outside in a kennel building. The puppies are born in the family room, and raised indoors with lots of love and handling, so they go from my home directly to yours. These are "people puppies" raised to be a loving part of your family. Fleetwood Farms is located near Akron, Ohio. Akron is in the Northern part of Ohio, about 40 miles south of Cleveland. Copyright 2009 Fleetwood Farms Irish Setters. All rights reserved to content and photos.